Step away from the truck and get back in your smart car. Sorry bud, you’re not manly enough. “They’re not for everyone,” the manly Australian narrator states in his husky man voice as the commercial begins. 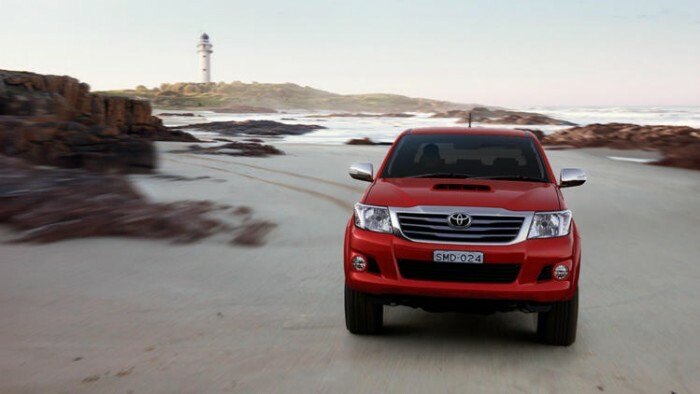 The narrator, and numerous other men who hope to be deemed manly enough to drive the Hilux, are then put through a series of tests that will eventually determine if they have what it takes to own a the tough truck. Physicals tests like having heavy tools dropped on them without showing pain; mental tests like picking a magazine out of a lineup that includes “Camping,” “Fishing,” “Fitness,” and “Fashion” (hint: Fashion is the wrong choice); and other tests like trying to get a fake sheep through an electric fence, walking on hot coals, and eating a hot pie without first blowing on it to cool it down. “Not everyone can own a Hilux,” says the narrator, who is handed the keys to his truck, becomes overwhelmed with emotion, and promptly has the keys taken away. Obviously, a man who shows his emotions (or a man interested in anything besides farming, hunting, fishing, and sports) isn’t a man who is deemed worthy of driving a pickup truck. Burnt feet is super manly. You’re probably reading this and thinking, “you’re taking this commercial way too seriously.” But imagine a young child who is bullied at school because he is slightly effeminate watching this and thinking he is not good enough because he cries when he experiences pain. Imagine a confused teen who is questioning his sexuality seeing this commercial and feeling like he is not good enough because he doesn’t fit into the mold society has made for him. This is the 21st century, and media like the Toyota Hilux commercial and the Chevy “Wheat Grass” commercial feel outdated and wrong. Shouldn’t we be embracing all kinds of personalities and letting each individual decide which vehicle he or she wants to drive, rather than playing to people’s insecurities and making them feel like outcasts? Sorry dude, you had it until you started crying like a girl. Sexism in commercials isn’t just something women have to look out for. It’s something that affects us all, and it needs to stop. Now.